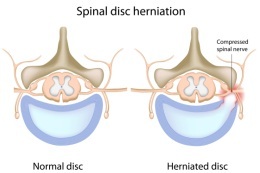 A slipped disc, also know as a prolapsed disc or herniated disc, ususally manifests itself as pain in the lower back which frequently extends down to the buttock, leg or foot. Each segment of the spine is cushioned by a flexible disc that protects the spine from vertically applied compressive forces (such as those that occur when we jump and land). The disc itself contains a pulpy substance called the “nucleus pulposus”. If the fibrous outer wall of the disc (the annulus fibrosus) ruptures then the inner core can leak out. The effect of the leaked core can be to trap the large sciatic nerve that runs along the spine. As anyone who’s suffered a slipped disc knows, the pain can be quite excruciating and physically debilitating. The sciatic nerve is the largest in the body. It is composed of individual nerve roots that originate in the spine. The nerve carries down then branches out to supply the skin as well as the muscles of the back of the thigh, the leg and the foot. Osteopathy can be effective in relieving a slipped disc and many clients find acupuncture excellent for reducing the pain. We can also advise on exercises to develop the core muscles to help support the load on your spine. Call Touch2Heal today to make an appointment at our Ashford clinic in Kent. I got my prolapsed disc playing cricket which was confirmed on the MRI scan. I saw Cecile for several sessions but felt the benefit straight away. She also showed me some exercise to do which helped relieve the strain. I managed to slip my disc just getting my laptop bag out of the back of my car. The pain was excruciating and went down the back of my left leg as well. Apparently I had trapped my Sciatic nerve. Cecile was able to work the area to reduce the pressure on the nerve which made a huge difference.